This contest saw a first time Arnold Classic Australia victory for a greatly improved ROELLY WINKLAAR. See the PREJUDGING for each PRO class through to the routines, exciting posedown and all awards at the FINALS. Includes Strongman highlights. A Tony Doherty Production as part of the IFBB Pro League Arnold Classic Australia. March 17th, 2018. Plenary Hall, Melbourne Convention & Exhibition Centre, VIC. Australia. This contest saw a first time Arnold Classic Australia victory for a greatly improved ROELLY WINKLAAR from the Netherlands. 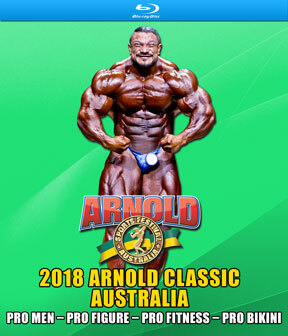 This was the fourth Arnold Classic Australia event and the best to date. See every round of the PREJUDGING for each PRO class through to the routines, exciting posedown and all awards at the FINALS. Around 4 hours of top class bodybuilding action, including Strongman Highlights. CANDICE LEWIS-CARTER retained her title in winning the Arnold Classic Pro Figure Class. ANGELICA TEIXEIRA again won the Arnold Classic Pro Bikini Class, and it was a first time winner in KATE ERRINGTON from UK winning the Pro Fitness title. Special Guest Poser was BREON ANSLEY (USA), 2018 Arnold Classic Men’s Physique champion in Columbus. Breon also retained his Olympia Classic Physique title in 2018. Highlights of the Arnold Strongman Australia, as shown on the big screens at the evening FINALS.